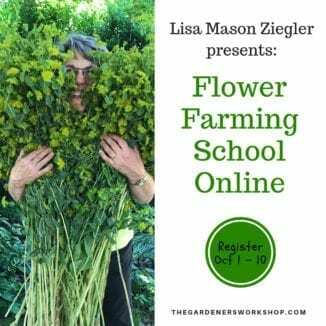 How Flower Farming School Online Works! I’m sharing more details on our Flower Farming School Online course! This post is to give a look at how the course works and how you will be able to interact with the technology and with us. When you purchase the course you will have unlimited access to all of the course materials: videos, slideshows, resources, etc. You will be asked to setup a username and password during checkout. This information will be required to re-enter our platform and get into your Library. You can enter your Library at anytime through the Course Login button located on our website Online Course page. In your Library will be the course Flower Farming School Online. If you also purchased Cool Flowers, Beyond the Book for Flower Farming it will also appear there. You click on the course to enter. Flower Farming School Online is a 6 week course. Once school starts October 29 a new class will appear in your course Library each week. You will have all 6 classes in your Library by the end of the 6 weeks. Each weekly class will include several sessions made up of videos and slideshows. There will also be resources attached to those weekly classes. I created the individual sessions to be 20 minutes or less so they can be easily watched on the fly if needed. We will have a private Facebook page that is for Flower Farming School Online students only. This is where all flower farming course questions can be posted. This page is monitored by myself and my team to answer questions and students can also support one another. I will also be doing Facebook Lives on this private page when a particular topic sparks lots of questions. The Live events will be announced in advance so you can attend, but it will also be recorded posted to your Library. You must have your own Facebook page to be able to join this closed group. I hope this answer some of your questions on how the whole online course works. Read what students are saying about this course here. Registration opens once a year in fall. School starts in late October. Registration is only open for 10 days. Sign up to be notified when the doors open here. Extensions for registration cannot be offered so please set a reminder! I hope to see you in school!